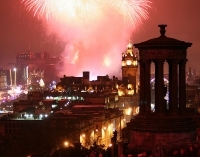 Hogmanay is Edinburgh's famous New Year's celebration, when the entire city becomes one huge party. In fact, it is so popular that entry to the city is open only to those with advance tickets. Over the years the organisation of Hogmanay has become increasingly professional, and a slick festival-style event, attracting major international musicians and bands who perform in the castle or the city's botanical gardens. Visitors are well advised to book tickets and accommodation as far in advance as they can, due to the sheer size and popularity of this event. The main festivities include a massive street party which attracts some 80,000 revellers to the heart of the city, where 12 giant screens and fireworks usher in the New Year. At the same time, the Concert in the Gardens hosts world-famous musicians entertaining the crowds. Another really popular event, taking place on December 30th, is the Torchlight Procession, in which about 35,000 people carry torches through the city streets for charity. Throughout the month of December, fun events and parties lead up to the main festivities, making it a glorious time to be in Edinburgh. Hogmanay is one of the most famous New Year's celebrations in the world.